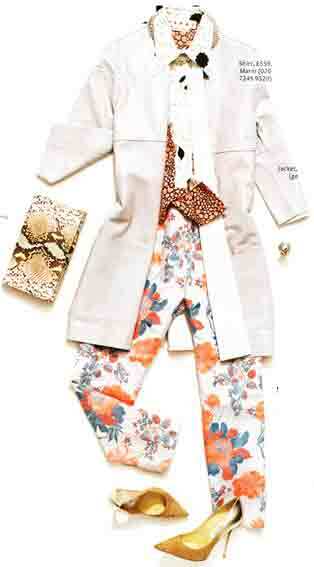 Another outfit from UK In Style magazine’s suggestions for summer weddings. With emphasis on combining very different contrasts in one outfit. Very different from the softly styled muted colouring kimono in my previous post. A straight thigh length jacket with seam interest. Made in a solid fabric (white for this summer’s theme), perhaps with a shiny texture or leather. 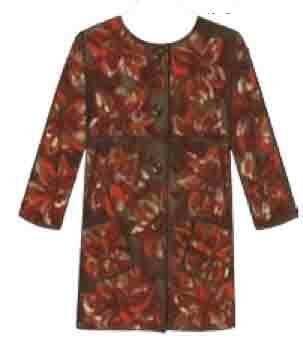 For the jacket pattern, try Kwik Sew 3732. Not clear from either image, but both jacket and pattern have large hip patch pockets. The outfit jacket also has matching seam interest across the sleeves, easy to add. And 3/4 sleeves – add to taste. 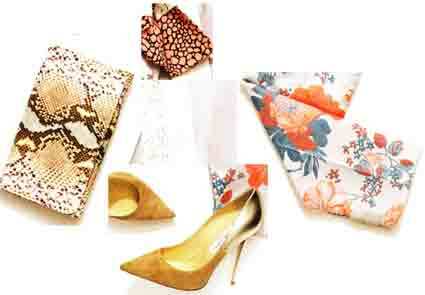 All this season’s textures and patterns in one outfit ! Combinations of solid flat, segmented mosaic (the snake skin), background-foreground (lace and scarf), or detailed painterly shapes. All integrated through the use of colour. Mainly white and warm, with a touch of complementary cool blue. This outfit is styled in clear colours. If your colouring is more muted, choose a print with muted pastel background for the pants, and repeat the background colour for the jacket and shirt. Whew, this sort of integration of opposites in styling takes talent or a lot of experimenting. I can’t do this or wear this level of variety myself, but I’m fascinated by outfits like this. Would you like to try it ? This entry was posted on July 27, 2013 at 8:21 am and is filed under current fashion. You can subscribe via RSS 2.0 feed to this post's comments. Both comments and pings are currently closed. Amazing prints and ideas, but I fear not for me…too much time investment in co-ordinating etc. However I know of one lady who dresses in this way and she looks very feminine and individual.